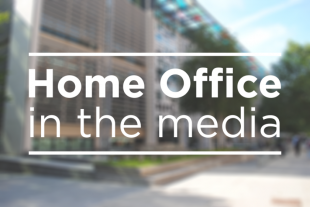 Today’s Home Office stories in the media include reports on the UK dropping opposition to the death penalty for the two Daesh “Beatles” who face trial in the US, the ongoing case of the former USB trader Kweku Adoboli and a report on violent crime. The Independent reports on claims by the Shadow Home Secretary that Government ministers misled Parliament over the UK dropping opposition to the death penalty for the two Daesh so-called “Beatles” who face trial in the US. Diane Abbott said that evidence which emerged in a legal challenge over the decision “directly contradicts” statements made by the Home Secretary and Security Minister to MPs. She has called on the Government to clarify why it “failed to seek assurances over the death penalty” and, in reference to recent reports that assurances were not sought for fear of damaging relations with the US, she added that “our policies should not be bent to the whims of the US president”. We are committed to making sure that these individuals, who are suspected of involvement in the most serious of crimes while fighting with Daesh overseas, face justice. It would be inappropriate to comment further as legal proceedings are ongoing. The Times and Guardian report on the case of Kweku Adoboli who has been released from a detention centre on bail as he continues his fight against deportation. Mr Adoboli, 38, was sentenced to seven years in prison in 2012 for his involvement in an illegal trading scheme at UBS that racked up losses of $2billion. He was freed from the immigration detention centre after supporters put up a surety of more than £100,000. The Times reports that Mr Adoboli is awaiting the outcome of a judicial review challenging a Home Office attempt to have him deported to Ghana. The review is due to take place in London on 23 October. All foreign nationals who are given a custodial sentence will be considered for removal. Foreign nationals who abuse our hospitality by committing crimes in the UK should be in no doubt of our determination to deport them and we have removed more than 44,500 foreign offenders since 2010. The Guardian reports on research conducted in Denmark which reveals a link between social mobility and crime. The paper states that the research carried out by the University of Manchester found that small improvements in parents’ social mobility can have a significant impact on the likelihood of children growing up to commit violent crime. The paper says academics behind the data claim it has relevance for the UK. Violent crime has devastating consequences on our communities. Our Serious Violence Strategy signals a step change in the Government's approach, addressing the root causes of violence by working with a range of agencies to focus on early intervention alongside strong law enforcement. The Strategy puts a stronger emphasis on steering young people away from violence, helping them to change their behaviour and actions before they reach the stage where they are at risk of entering the criminal justice system.